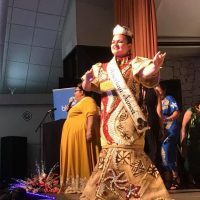 The new Miss American Samoa, 24 year-old Magalita Philomena Johnson has chosen as her platform streghtening homes and families. She was sponsored for the competition by her parents Fiatagata and Paul Johnson of Vaitogi. Magalita also won the pre pageant interview, the stage interview and the talent category. Co emcee Attorney Tosimae’a Tupua posed her this question Friday night. First runner was Brittney Unasa Galo sponsored by Tutuila Store, second runner up was Miss TNT Recycling Talileleia Tasi, 3rd runner up was Edwina Laina Tanielu Miss Western Union and the fourth runner up was Christine Duterte sponsored by Pacifc Refrigeration.